It’s the holiday season, which means there will probably be a lot of celebrating going on. If you’re having a party, you may be looking to pair wine and cheese, which is an often-daunting prospect. Thus, I’m delighted to have this guest post from Sara Kahn, Founder of The Cheese Ambassador. Whether you are hosting a soiree or a casual get-together this holiday, your mission is to provide your guests with warm hospitality, lively conversation and a delectable spread of food and drink. Whether the menu is complicated or simple it better be delicious. Serving a sumptuous gourmet cheese course is perfect as a starter or centerpiece of the meal. Not only is the preparation simple (no cooking!) but more importantly, your guests will enjoy discovering and savoring new favorites. As a wine lover, you want to impress with the right pairings but the overwhelming selections of wine and cheese can make your head spin. Relax. There are no hard and fast rules when it comes to choosing the right combinations of cheese and wine. Just keep in mind a few simple considerations. A cheese course is about observing and enjoying contrasting and complementary flavors. 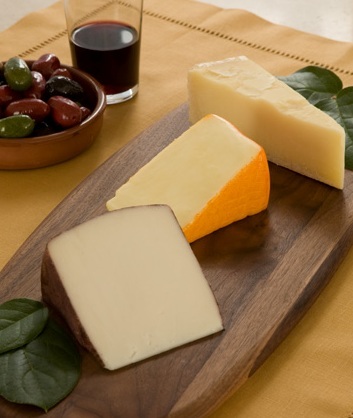 For a foolproof gourmet cheese course, select 3 – 5 cheeses that vary in texture and flavor. Add some crusty bread, fresh or dried fruit, olives and nuts and voila! Remember, wines are meant to cleanse the palate, wash away the tongue-coating richness of the cheese and prepare your mouth for the next delicious bite. It’s important that your selections don’t overwhelm the cheese and vice versa. Essentially, you’ll want to match wine and cheese of the same intensity level. Just remember “like for like”. Take a look at the gourmet cheese categories and wine recommendations below for guidance. You’ll see how easy it is to serve an elegant wine and cheese course. For best results, just add friends and family. Beverage Pairings – Seek out a carbonated beverage to refresh the mouth from the rich and creamy flavors. Traditionally, bloomy cheeses are served with French Champagne but also try Cava from Spain and Prosecco from Italy. Washed Rind – During the aging process, washed-rind cheeses are usually bathed in a brine or washed with liquor such as wine, beer or a spirits. It’s this brining process that gives the cheese an aromatic quality. Almost all have orange or reddish hued rinds. Not mild and not sharp, washed rind cheeses are full-flavored. Give Taleggio, Drunken Goat, and Epoisses a taste. Beverage Pairings – Sample these with light and fruity reds such as a Pinot Noir or fruity whites such as Sancerre. Firm – Typically, firm cheeses are still pliable and packed with flavor. The best are a bit crumbly and aged for robust, nutty goodness. Cheddar, Gouda and Gruyere are crowd pleasers. Beverage Pairings – A pint of English ale is the traditional beverage of choice for Cheddar but a Sauvignon Blanc is complex enough to complement. Gouda is great with a Syrah/Shiraz and drink Beaujolais with Gruyere. Blue – The bluish-green veins give blue cheese its punch. Listed from strong to strongest in pungency are creamy Gorgonzola, nutty Stilton and salty Roquefort. Beverage Pairings – Intense gourmet cheeses like blues can be tamed with sweet dessert wines, liqueurs and even a fruity beer. Port and sherry are traditional blue libations. For a unique treat, try a raspberry flavored beer like Belgian Lambic (look for Lindeman’s Framboise). All can be savored while lingering over dessert. Even though her passion for gourmet cheese was undying, Sara Kahn found shopping for it to be overwhelming, time consuming and confusing. She established The Cheese Ambassador to offer a simple way to select and serve the world’s finest cheeses. By providing the perfect combination of exquisite cheese along with a comprehensive cheese course guide, enjoying gourmet cheese is now a deliciously enriching experience.